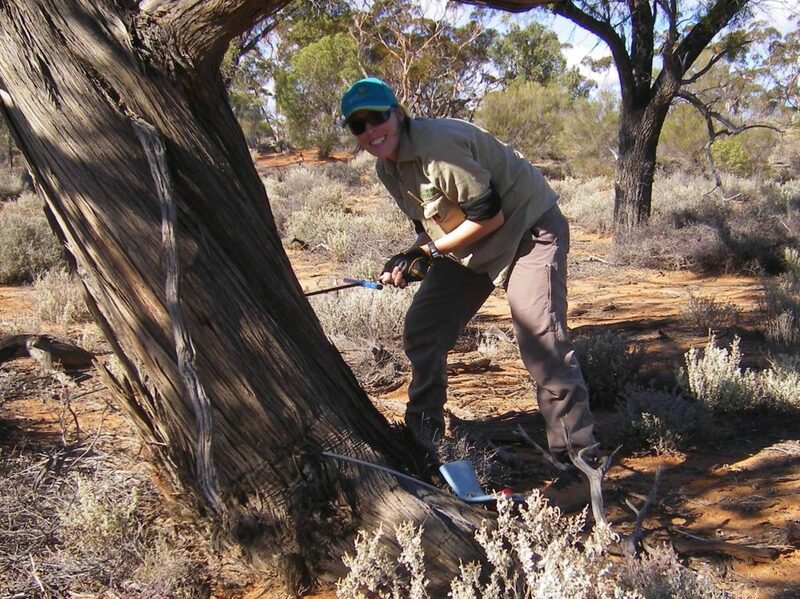 Received the Australian Flora Foundation Young Scientist Award for her talk at ESA2007, the Ecological Society of Australia Conference on 25 – 30 November 2007 at the Perth Convention Centre, Perth, Western Australia. We aimed to reconstruct the fire history of the Lake Johnston region in southern Western Australia to develop an understanding of a ‘natural’ fire regime. This region consists of ~1.5m ha of relatively undisturbed semi-arid shrubland and woodland. Intervention for fire management has been minimal and limited to recent years; hence, the fire history of the region remains relatively unaltered and provides us with a unique opportunity to observe ‘natural’ fire patterns, which have been readily altered elsewhere. Fire boundaries were manually digitised from available aerial (1958) and satellite imagery (1972-2005) and stored in a geographical information system. In order to validate this database and to more accurately define dates of older (pre-1985) fires, we examined the stand age structure of two native cypress pines (Callitris preissii and C. canescens). These Callitris spp. are killed outright by fire and are serotinous obligate seeders (release seed and germinate following fire). Consequently, stand age may be used as a proxy measure of time since fire. To calibrate for a potential delay in germination following fire, stem sections were collected from mapped fire scars of both known (post-1972) and uncertain (pre-1972) age. Stem sections were aged using standard dendrochronology techniques. A one to two year lag in germination post-fire was determined and the age structure of fire-regenerated stands was even (within-stand age variation up to five years). These results confirm that Callitris stand age is a strong proxy measure of time since fire; hence, these data were used to confirm the occurrence and date of historical fires. Preliminary examination of fire patterns revealed that since the early 1940s, more than one-third of the study region remained unburnt while 32% of the region burnt repeatedly (up to three times). These data suggest that fires are preferentially occurring over previously burnt areas (scars) rather than long unburnt areas. Further work aims to determine driversand constraints of such apparent spatio-temporal fire patterns.